“I can swing a hammer” is a phrase I use whenever people around the Playhouse are looking for help. Who can help me with moving chairs to set up the theatre? I can swing a hammer. Is anyone free to help hold this ladder for the light hang? I can swing a hammer. Who might be able to put up these marketing posters around town? I can swing a hammer. Anyone free to help with load in and painting? I can swing a hammer. Who wants leftover brownies from the Norris Center event? I can swing a hammer. It’s not remarkably helpful, I know. We don’t use a lot of hammers around here. We use professional tools that I probably shouldn’t try to name here in order to keep my pride intact. 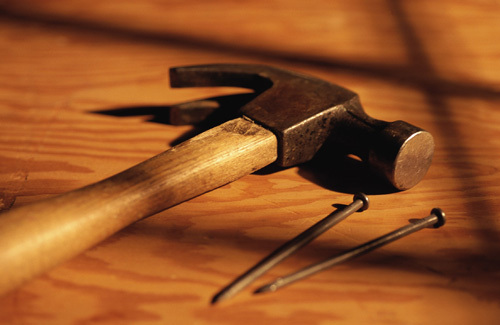 My stating “I can swing a hammer” simply voices my willingness to be an extra set of hands when necessary. I find that our staff is definitely willing to help when a part of the team is in need. We’re growing fast, but it is still necessary for any of us to roll up our sleeves and help fellow team members. No department operates on an island at Gulfshore Playhouse. We are all working towards one, great goal – be it a show, a deadline, a project or a special event. Last night, each and every staff member came in to work on the set. We worked to achieve the high-quality of theatrical excellence that the Playhouse has become known for. And it required all hands. It required me with a can of paint. It required a go-getter attitude from everyone. It required cleaning brushes, painting, building and a positive attitude. It required rolling up our sleeves. It required me swinging a hammer. In order to make the dream happen, a lot of people have to be involved and have to be dedicated. Luckily, we have this INCREDIBLE art to be a part of and, as we say at Gulfshore Playhouse, “teamwork makes the dream work.” So, last night I swung a hammer in the form of painting doors and doorways. I swung a hammer by stepping up to help as I know any of my co-workers would do for me. We have this amazing opportunity to offer theatre to the masses, and it cannot be accomplished alone. It requires a little hammer swinging every now and then.